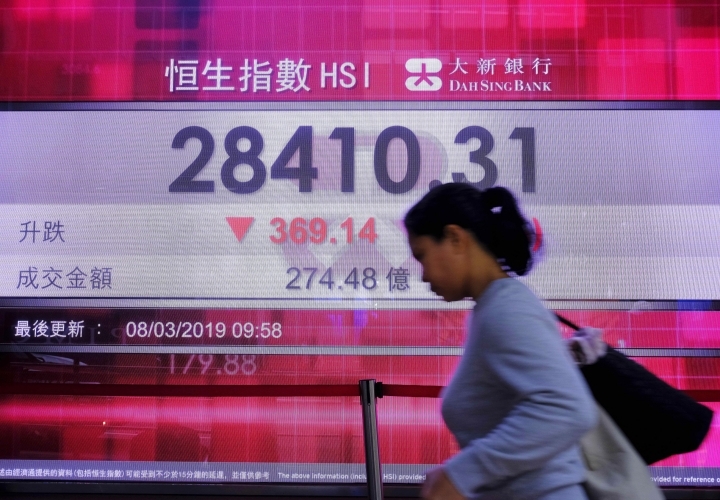 SINGAPORE — Shanghai led a retreat in world markets on Friday amid worries that the U.S. and China may not be as close to a trade deal as President Donald Trump has suggested. Selling picked up after China reported that its exports plunged more than 20 percent in February from a year earlier. 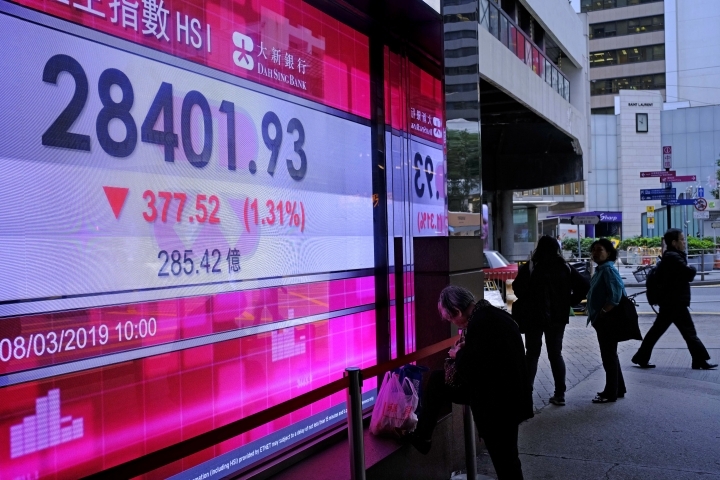 The Shanghai Composite tumbled 4.4 percent to 2,969.86, while Hong Kong's Hang Seng sank 1.9 percent to 28,228.42. Asia's gloom spread to Europe, where the CAC 40 in France lost 0.4 percent to 5,245. Germany's DAX fell 0.7 percent to 11,440, while Britain's FTSE 100 declined 0.9 percent to 7,092. Wall Street was also set for losses at the open. Futures for the broad S&P 500 index fell 0.4 percent to 2,739. The S&P 500 closed lower for the fourth straight day on Thursday and is poised for its first weekly drop since January. Dow futures declined 0.3 percent to 25,364. On Thursday, The New York Times reported that the U.S. and China had reached a broad agreement on removing some tariffs in both countries. This involves China buying more American goods and opening some of its markets further to foreign companies, it said. But the report said negotiators haven't locked down key details, like when the tariffs will be removed and how to ensure China holds up its end of the deal. It added, citing two people familiar with Beijing's position, that Chinese officials were wary about the final terms given Trump's proclivity for last minute-changes. Trump told reporters Wednesday that negotiations were "moving along very nicely." Last week, the U.S. shelved a tariff hike on $200 billion in Chinese goods to give officials time to work out a deal. Losses Friday were compounded by concerns about the global economy. The European Central Bank this week cut its forecasts for eurozone economic growth and decided to provide more stimulus, highlighting the extent of its concerns. Later, customs data showed China's exports fell 20.7 percent in February from a year earlier, far more than the expected 4.8 percent decline. Imports also missed the mark, dropping 5.2 percent. The report suggests the economy is slowing further. Japan's benchmark Nikkei 225 sank 2 percent to 21,025.56, even after the government said its economy grew 1.9 percent in 2018's fourth quarter, from a year ago. This was better than the initial estimate of 1.4 percent. South Korea's Kospi fell 1.3 percent to 2,137.44 and Australia's S&P/ASX 200 eased 1 percent to 6,203.80. 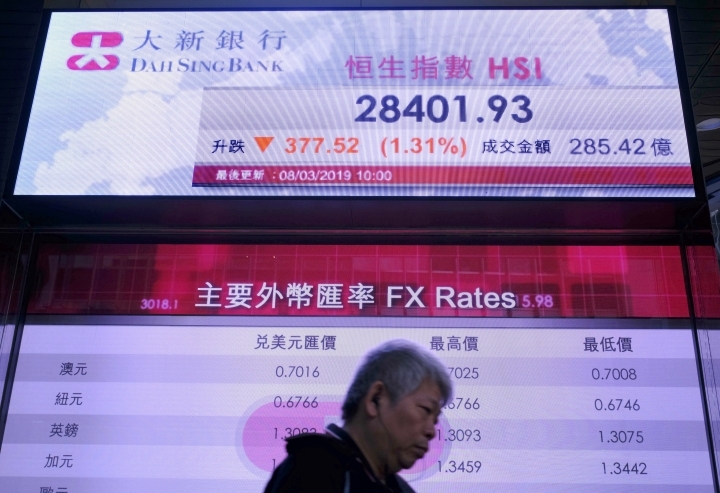 Stocks fell in Taiwan and throughout Southeast Asia. ENERGY: Oil prices fell after Norway said its $1 trillion wealth fund would begin dumping its shares in oil and gas companies. U.S. crude lost 87 cents to $55.79 a barrel in electronic trading on the New York Mercantile Exchange. It had picked up 44 cents on Thursday. Brent crude, used to price international oils, shed $1.11 to $65.19 a barrel in London. The contract rose 31 cents the day before. CURRENCIES: The dollar weakened to 111.18 yen from 111.57 yen late Thursday. The euro advanced to $1.1215 from $1.1194.